A couple of weeks ago I received a very exciting email from Charlotte Lewis telling me I had won a Gold Ticket to London Fashion Weekend on Saturday (22nd). I was so excited and started planning my outfit straight away! I didn't need any directions to Somerset House when I stepped out of Charing Cross tube station, as I had enough fashionable, heeled girls walking in a certain direction. The atmosphere at Somerset was incredible - I always love the energy at fashion events! I didn't have long to look around before was entering the tent to watch the first show, showcasing the four main trends this Spring/Summer. All outfits were from and styled by the outnet.com. 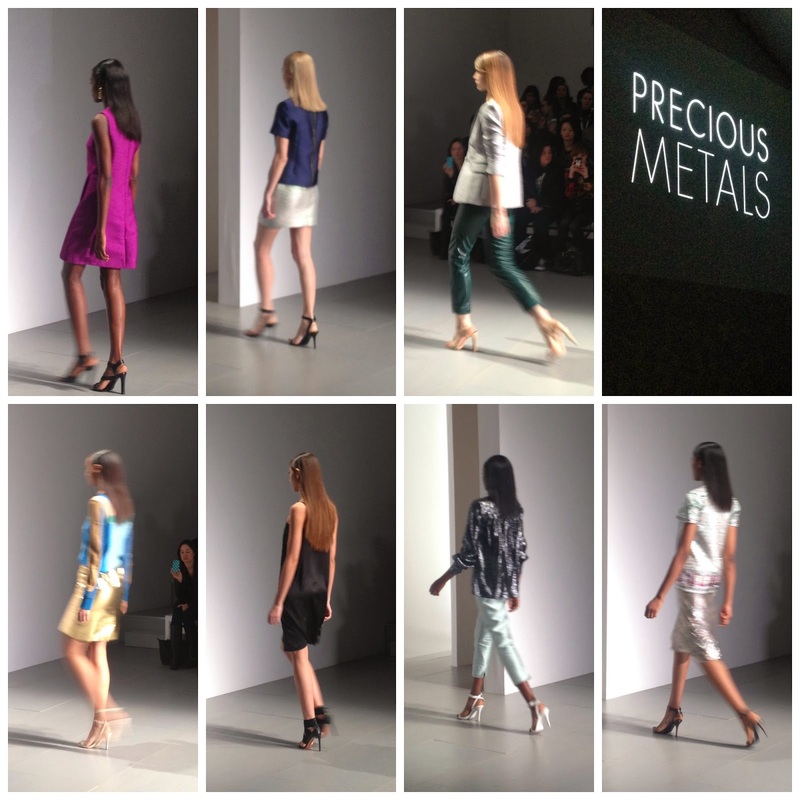 The first trend was Precious Metals. For a girl who likes anything shinny this is perfect for me! You can keep it casual in the day with a silver skirt & plain black t-shirt or go all out at night in a shinny purple a-line dress. 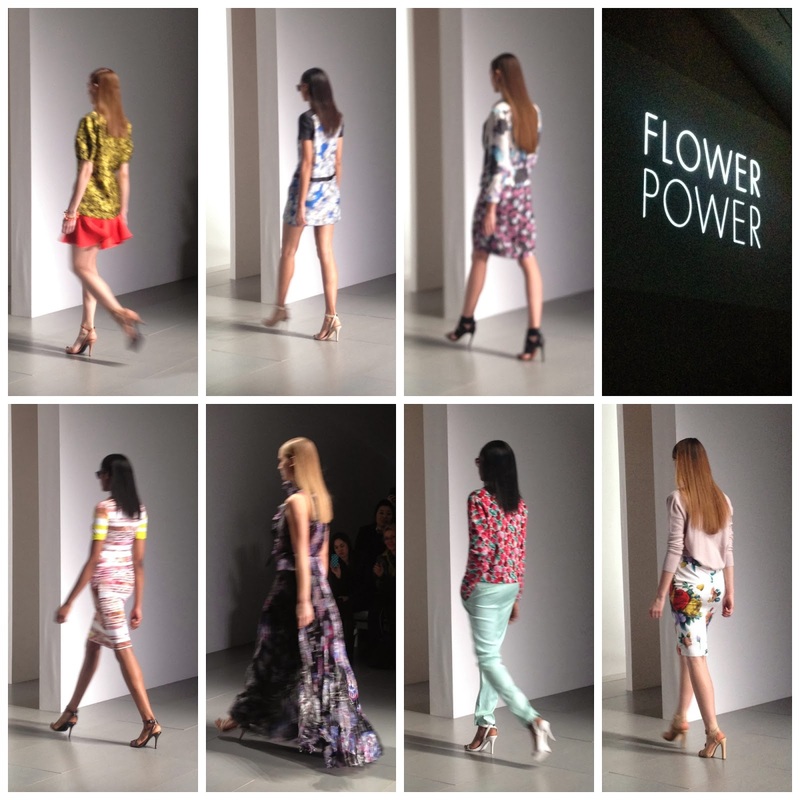 Flower Power followed. Florals are featured every Summer, but this year it's all about bold prints & bright colours, matched with both pastel or dark coloured accessories. 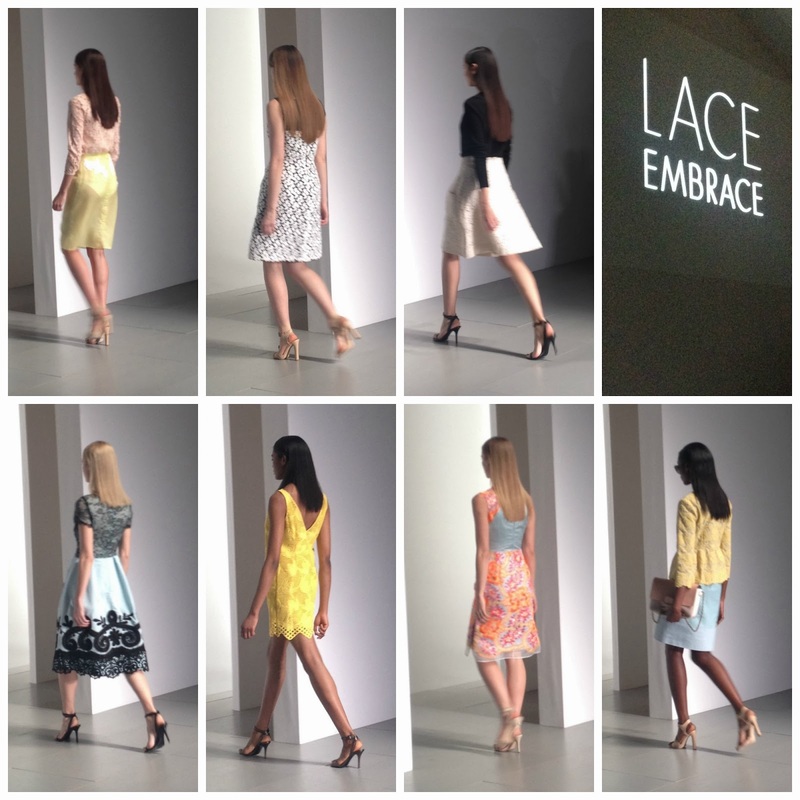 Lace Embrace was next. We've seen lace in the A/W just gone in a very intricate & romantic way. 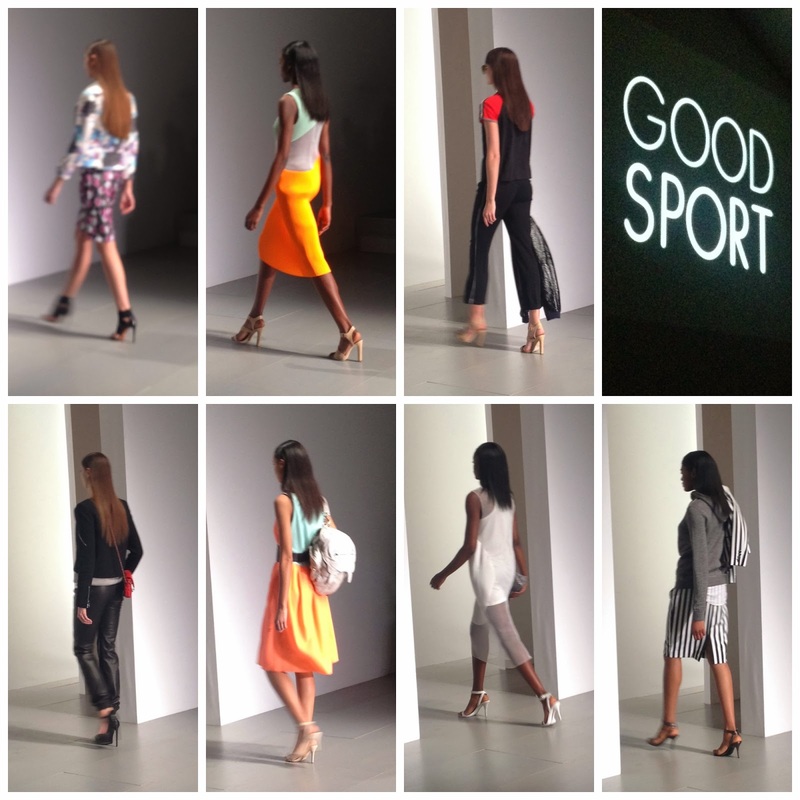 This S/S, there are still elements of last season, but a majority is bold, with more neon colours featured. Finally Good Sport. If you were going to invest in one trend, this would be it as you'll be wearing it in A/W14 too. My favourite looks are the racer front dresses or bomber jackets paired with smart track pants. And make the most of trainers - fashion has finally given it's seal of approval for comfy shoes - milk it! I just had enough time to pick up my free nail varnish (Thank you Vodafone), before I started queuing up for the most exciting part of the day - the designer show! And who is the designer you ask? Mr Julien MacDonald! His dresses were absolutely breathtaking! Hilary Alexander, the Fashion Director of The Daily Telegraph, talked about the designer before the show started and described him as the King of Bling. Hilary's warning about the lack of material used was correct, but the sparkles & flowing trains has made him my favourite designer of Spring/Summer. I just need to to find an occasion to wear one. Below is the Julien MacDonald finale. After a look around the stalls, I headed back home to Notts. I cannot wait to be working in London and around this atmosphere daily. Until next season! Whose your favourite designer this season?